Santorini beaches are unique and different from any other because of their red and black volcanic pebbles along the shoreline set with a beautiful backdrop of steep cliffs and lush greenery. The most famous ones are located along the south-eastern and eastern coast of the island and are well organized with chairs, umbrellas, and various water sports. Some are secluded with a relatively easy access. 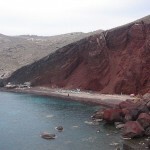 Red Beach: known as Kokini Paralia is located at not far from the ancient site of Akrotiri, it’s the most famous and beautiful beach of the island for its black and red volcanic rocks. It is famed as red beach because of the impressive red lava cliffs and the sparkling red sands. You can find foods and drinks nearby. This beach is accessible by cars and then by walk. White Beach: it is so called for the spectacular white cliffs surrounding the beach. It is not ideal for children as the only way to get there is by sea. There is a regular boat taxi from the Red Beach bringing people onto the beach. Vlyhada: a moonscape beach with carved mountiains at it back which have been shaped by the wind and the sea. Kambia: a very quiet beach located near the red and the white ones. These short beach has no sand but pebbles and a very crystal water. It can be reach by sea or by car/scooter through a long dirt road going downhill, but it’s signposted from the lighthouse. A smal fish tavern, two rows of umbrellas and sunbeds are available here. Kamari: a very populated and well organised beach known for it’s black sand and pebbles. The beautiful black sandy beach of Kamari stretches for five miles in length along the eastern coast of the island. You don’t have to walk far to find taverns on the seafront as well as restaurants, shops and entertainment spots. A number of water sports are also available like water skiing, windsurfing and paddleboats. Perissa: It is a very popular place that fascinates for its unique, long, black sand beach. It stretches for miles and merges with Perivolos beach. A feature that makes Perissa unique (besides the crystal water and the smooth sand) is the fact that is the best protected beach from the summer Aegean winds. Water sport facilities are available also. Perivolos: it’s the extention of Perissa beach. It’s a very populated beach with small taverns, beach bars and rooms to let opposite the beach. It is located on the southern tip of the island. Sport facilities are available also. Koloumbos, Paradise Beach & Baxedes: these are secluded sandy beaches located north of Santorini, nevertheless there are sunbeds, chairs and umbrellas with small beach bars for resreshments and sandwiches. Ideal for those who are looking for a peaceful suntime and for high waves. They are reachable, in order, taking the eastern costal road from Fira. Monolithos: it is a very family friendly beach situated at the eastern part of the island and close to the Kamari black beach with dark sand and deep blue crystal clear water. It is very quite and offers a very few hotels and rooms, cafes and restaurants. The Monolithos beach is very beautiful with children play area, basket ball court and footballs pitch. This place is better accessible by cars and public buses run frequently in summer.